Francesco is not just somebody’s pigeon. Francesco is my pigeon, and I am his person. Francesco is a soulful bird, quiet and peaceful but always communicative and full of emotion. He is gentle and intelligent. He brims with personality and life. “What kind of bird is this?” That simple text message, along with the photograph that accompanied it, marked the beginning of my role as a pigeon-mom. It also led me to Palomacy, a pigeon and dove rescue organization comprised of the most extraordinary individuals whom one could ever hope to meet. The text was from my co-worker, Kathryn. The bird featured in the photograph was Francesco, an amazing pigeon who has touched my life in a most profound way. One summer afternoon two months ago, Francesco flew over the fence into Kathryn’s yard, where she and her family were enjoying their day poolside. Francesco was clearly a tame bird, readily approaching them and even hopping up onto the lawn furniture to sit next to them. Though tame, he had no band, nothing by which to identify the person to whom he might belong. The family decided to let the bird stay while they continued to swim and talk – and stay the bird did. Hours passed, and Francesco stayed. The family went indoors, and Francesco stayed. Actually, no, he did not stay when they went indoors. He tried to follow them into the house. Evening approached, and Francesco made it clear that he did not plan to go anywhere. Kathryn decided that she had to act. Naturally, she reached out to me, not because I had any knowledge of pigeons, but because I am that crazy bird lady and lover of all animals, one of those people who is easily suckered into permanently housing any creature in need. “Kathryn, can’t you take the bird?” I already knew the answer to my question. Kathryn could not take him. What else could I do but drive the forty minutes to her house with one of my parrot’s travel cages in tow? What did I know about pigeons? Absolutely nothing. I had not the foggiest idea what to do with this pigeon whom I had just welcomed into our home. Moreover, as it happened, my knowledge of parrots did not transfer to pigeons – at all. I was clueless as to this pigeon’s needs and began to panic. Why is he making such weird noises and running around in circles? Why is his neck so puffed up that it resembles a lion’s mane? Why on earth is he twitching his wings – is he having a seizure? Knowing that you are responsible for a living creature about which you are completely ignorant is an excruciatingly humbling and terrifying experience. To my dismay, I quickly discovered that I was not alone in my ignorance. For about five days, I did the best that I could to take care of this bird. I received a lot of advice from folks who meant well but who also did not have the knowledge to help me, including an avian veterinarian who treated Francesco for a respiratory infection and parasites but also told me that he may be a wild pigeon and that I should consider releasing him into the wild once he was strong and healthy again. That last bit of advice just did not sit well with me, and it was the last straw. I absolutely had to find someone who knew enough about pigeons and who could help me. 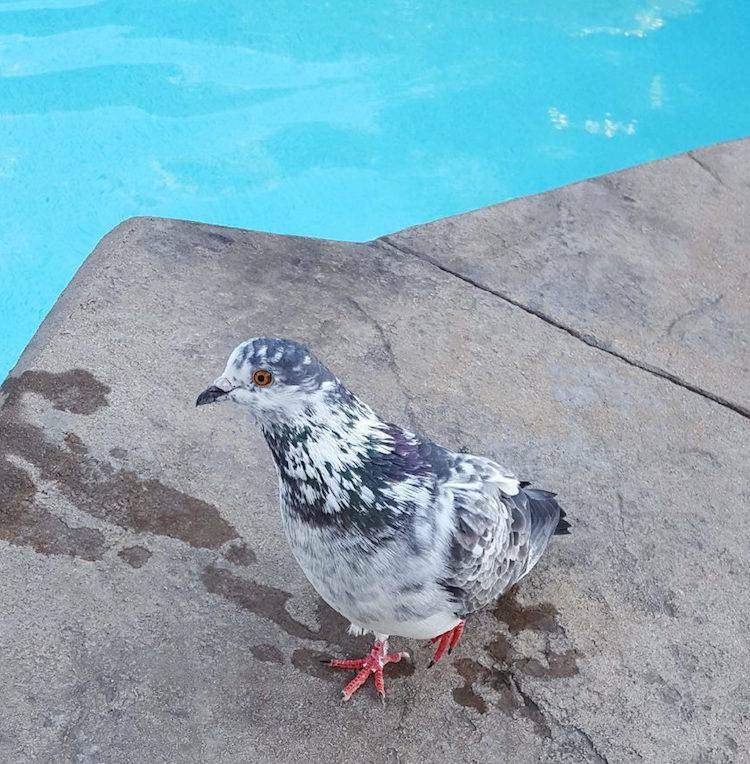 I had exhausted all local resources, but during an internet search days earlier, I had come across a California pigeon and dove rescue organization called Palomacy. I decided to send a message to the rescue’s Facebook page, hoping against hope that someone at this organization would take the time to read my plea for help in Connecticut and agree to call me. That very same day, Elizabeth spent the better part of an hour on the phone with me, telling me all about pigeons, offering her invaluable insight and advice, and answering my countless questions with the patience of a saint. I will never be able to express to Elizabeth how grateful I felt for her support that day and how grateful I remain for her continuing support. At Elizabeth’s invitation, I also joined the Palomacy Facebook Group. When I first joined the group, it was just a resource for me, a group of people with much more knowledge than I had about pigeons, a group of people who could answer questions and help me take proper care of Francesco. Within minutes, sometimes seconds, after posting a question, answers and suggestions appeared. Armed with the help, support, and encouragement of the group, I finally began to relax and was able to enjoy Francesco. And so, what kind of bird is this? My answer to Kathryn’s question on that fateful day was simply that the bird featured in that photograph was someone’s pigeon. Today, my answer to that same question is vastly different. Francesco is not just somebody’s pigeon. Francesco is my pigeon, and I am his person. Francesco is a soulful bird, quiet and peaceful but always communicative and full of emotion. He is gentle and intelligent. He brims with personality and life. Francesco has many “hobbies.” He loves to listen to music at night before bed, and he loves to follow me all around the room. He “helps” me with whatever task I am trying to accomplish. His favorite pastime, though, is to sit next to me, nod his head, and twitch his wings. We have to have several of these sessions each day. And though he is most content when I am home with him, he also seems to enjoy the good company of his little stuffed Snoopy toy, pink owl, and miniature Eyore. I often find him cuddled up in his nest with this “flock” when I come home to him after work – which brings me to his nest – Francesco loves his nest, a beautiful woven basket that I bought especially for him at Whole Foods. How do I know that Francesco loves this overpriced nest? Well, why else would he so lovingly and carefully furnish it with about fifteen to twenty pieces of Timothy hay? After all, pigeons who don’t just adore their nest would never take the time and energy to carry fifteen pieces of hay to said nest! Icould talk about Francesco and who he is all day long, but I will save some of that for another story. 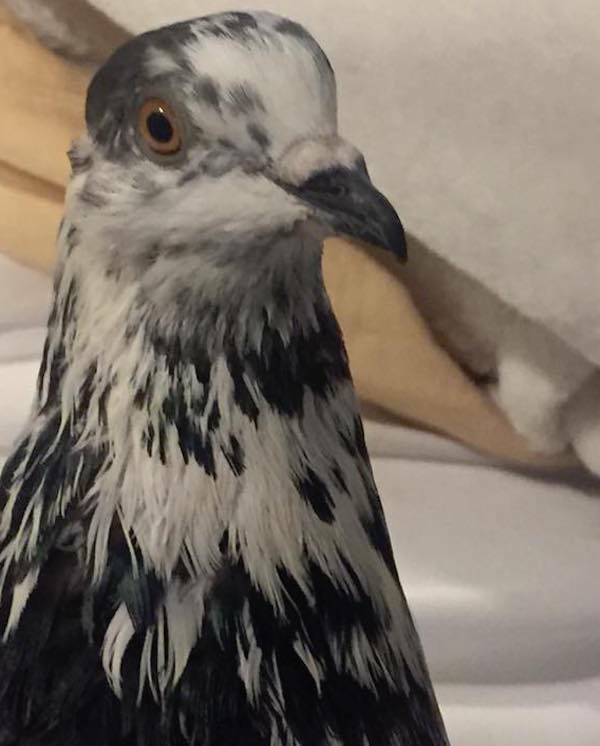 Suffice it to say that from Francesco, Elizabeth Young, and the Palomacy Group, I learned that pigeons are absolutely amazing creatures. Pigeons are homebodies. They mate for life. They have “pigeon marriages” and will stay with their “pigeon spouse” even as the beloved mate is dying. Pigeons are fiercely loyal, devoted, emotional, romantic, and intelligent beings. Indeed, they possess all of the same traits that people value in other people. I learned all of this and then some about pigeons from Elizabeth and from the Palomacy Group, but I also learned more. Palomacy has enriched my life in a way that I never expected. Every time I log onto my Facebook page, my feed is overflowing with stories about people rescuing precious life. These days, my Facebook feed is literally flooded with human kindness, kindness toward the lives rescued as well as toward the people doing the rescuing. 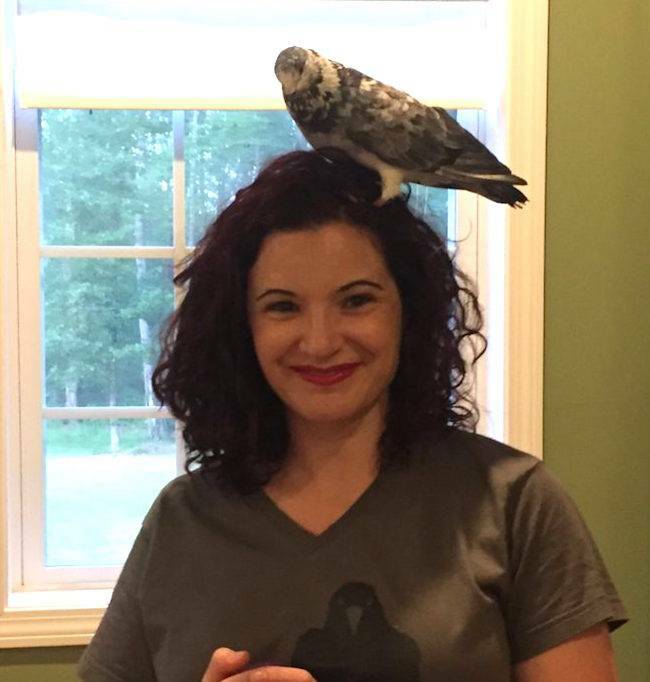 Palomacy is an exceptional organization, and Elizabeth Young is an exceptional individual. I just cannot sing her praises enough. Elizabeth and those who support her rescue embody the qualities that we value most in life – compassion, empathy, integrity, industriousness, devotion, honesty, and loving-kindness. 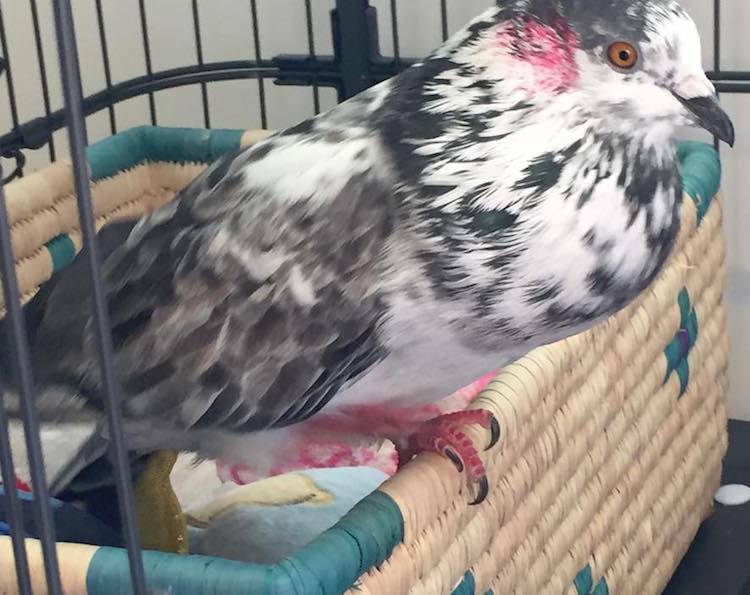 Quite frankly, Palomacy embodies the traits of the very birds that it rescues. Who wouldn’t want to be part of an organization like that, who wouldn’t want to donate to an organization like that, and who wouldn’t want to learn about and love the birds that Palomacy works so tirelessly to save? Palomacy – it’s for the birds, and it’s for the people too. It’s for all of us who want to make this world a better place, one act of kindness at a time. Lori lives in Connecticut with her girlfriend and life-partner. They are owned by Francesco as well as by their two dogs, four parrots, three cats, and two guinea pigs. To feed all of these mouths, Lori spends her days as an attorney, advocating for employee rights.